US$39.50. WE HAVE ONLY BLEMISHED COPIES. Philip T. Hill was the first American to win the Grand Prix Driver’s Championship. Since that win in 1961, only Mario Andretti has joined Hill as an American winner of that coveted title. Long sought after by auto racing enthusiasts worldwide, the first edition of Phil Hill: Yankee Champion has become extremely valuable. This revised, expanded edition includes 114 photos printed in a “warm” black ink on 48 pages of premium gloss paper. The photo sections feature the work of: Louis Klemantaski, Flip Schulke, Dave Friedman, Bob Tronolone, Bernard Cahier, Geoffrey Goddard, Peter Coltrin, Griffith Borgeson, Jim Sitz, Bob Canaan. 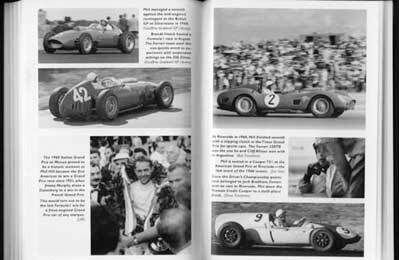 While the focus of the book remains Phil Hill’s early racing years, culminating with his Grand Prix championship win with Ferrari in 1961, William F. Nolan has given us a new chapter completing the picture of Hill’s life and career after that win. 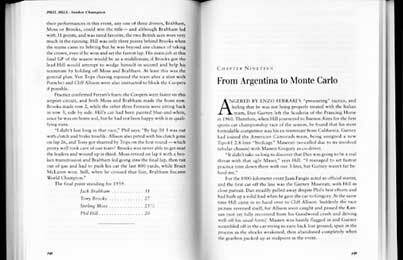 The book describes in detail Hill’s early drives in MGs and Jaguars, in addition to his many private and factory Ferrari drives, and his later entries with ATS and Cooper GP cars. This new edition goes on to cover Hill’s races with Carroll Shelby’s Cobra team, Ford’s GT40s, and Jim Hall’s Chaparrals, as well as Phil Hill’s life as a family man and his work as one of the foremost classic car restorers. A “Table of International Successes” and a seven page index complete this expanded hardcover edition. For the dust jacket Brown Fox Books commissioned Peter Hearsey to depict Phil driving a Ferrari 246 to his first Grand Prix win (Monza, Italy 1960). This was the first Grand Prix won by an American driver in over 39 year, and the last win ever for a front-engined Grand Prix car. You can view a 20 page Adobe Acrobat file that contains the Contents, Introduction, Preface, Chapter One, Table of International Race Sucesses, and the complete index for this book. No photos in this file. PHIL HILL: Yankee Champion, By Wiiliam F. Nolan, ISBN 1-188978-10-4, Hardcover, 6x9, 280 pages, including 48 pgs of photos. US$39.50 Standard Media Mail shipping for the US is $4.00. Tax on California orders is 7.75%. We have only "hurt" copies of Phil Hill: Yankee Champion. These books are perfect except under the dust jacket the hard cover is blemished with a bent corner. The dust jackets are mint. John Fitch: “Phil’s passing brings a deep sense of loss that won’t go away. Though separated by a continent, or an ocean, I shared the joy of his victories like a brother and treasured our warm friendship. Love to Alma and the family." Stirling Moss: “Phil was a friend first and a great competitor, but what a gentleman!"